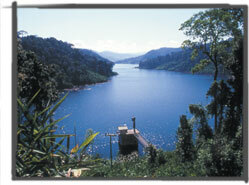 The Ang Nam Leuk reservoir is a small artificial lake, located in the central-northern part of the park. It is surrounded with dense green forest. This magnificent scenery is a tourist destination in its own right. It offers a cool retreat from the heat of Vientiane during the March to May hot season. The beautiful narrow lake is best explored by boat. These boat or canoe trips are particularly interesting for bird and wildlife watching. 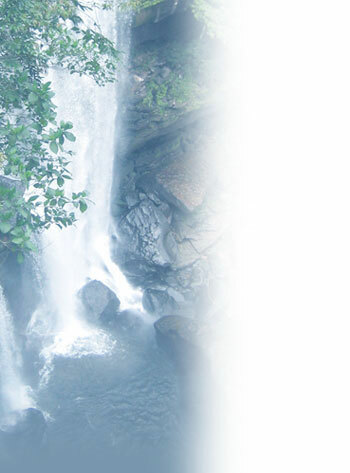 It is also possible to visit the Tad Leuk Waterfall, a beautiful nature trekking where you can enjoy wildlife observation go camping in the forest. Multiple-day trekking can be booked on pre-arranged tours in Vientiane. The river Nam Leuk originates in the far northwest of the park at the slopes of Phou Sang Mountain (1666 m). A dam, about 15 kilometres upstream of Tad Leuk and opened only in 2001, has been constructed for power generation. It covers 1280 hectares at the height of the wet season. The lake is relatively easy accessible by car or motorbike (and of course bicycle for the ‘die-hards’) from Vientiane via National Road No. 13 (South). Turn left at Km 90, short before entering Thabok. Signs along the way will guide you. From Vientiane, Ang Nam Leuk is just a 2,5 hour-drive away. It therefore makes for a perfect day trip. It is possible to go camping overnight on a pre-arranged trip through various tour operators in Vientiane.